Picture your name (or favorite phrase) in lights…bright, color-changing lights. Picture your name or favorite phrase in lights… bright, color-changing lights. 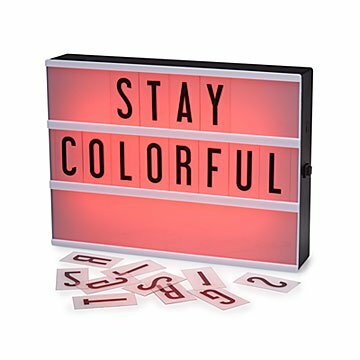 This colorful, retro lightbox adds blockbuster bling to special occasions and everyday spaces in need of some inspiration. Back-lit like a real marquee, it cycles through a spectrum of colors or stops on your hue of choice, including classic white. The piece comes in three sizes including mini for your desktop or side table, standard, or large for special occasions like weddings or birthdays. Lightweight and portable, you can slide any creative combination of the included characters into three slotted lines. Battery or USB-powered. Made in China. Mini -Includes 100 letters, numbers and characters plus blank tiles. Standard -Includes 100 letters, numbers and characters plus blank tiles. Marquee -160 letters, numbers and characters plus blank tiles. This makes an ideal surprise gift. FUN AND VERSATILE PRODUCT FOR ALL AGES! I have this set up in the kitchen and the family takes turns surprising each other with new messages. Teenagers are notoriously difficult to shop for. I saw this item and immediately thought of my daughter. She loves it! I plan to sneak into her room and post positive thoughts, good energy.